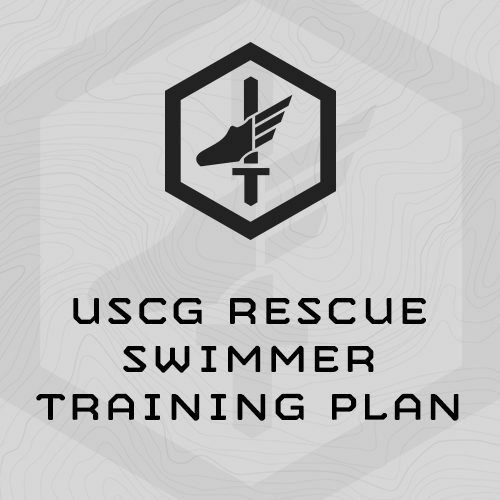 Applicants should begin this program 7 weeks prior to taking the AST Screening Test or beginning Rescue Swimmer Training. The program includes a 1-week taper which will allow the athlete to recover and prepare for their test or selection. This plan can be very intense at times and may not be suitable for unfit athletes. Be safe and smart about your training as you work through the program and don’t be afraid to cut down sessions, or if necessary take an extra rest day if needed. This program follows a general format and gets progressively harder each week. The plan is designed so that applicants train 5 days per week (Monday-Thursday and Saturday). If you are unable to follow this format, that is fine. Simply do the workouts on the available days of the week without skipping workouts. This training program is 7 weeks long. Week 1, Week 4 and Week 7 are used to assess and reassess performance on the AST Screener and a 400m buddy tow. Week 7 is also used as an unload week to allow the athlete to recover and prepare for their AST Screening Test or the beginning of Rescue Swimmer Training. Training sessions will take 60-100 minutes. 30% Max Push-Ups, then immediately…. 40% Max Pull-Ups, then immediately….